What stemmed from visiting a friend in Chicago turned into a great half marathon and a PR! Friends, good food, running - I couldn't ask for a better weekend. 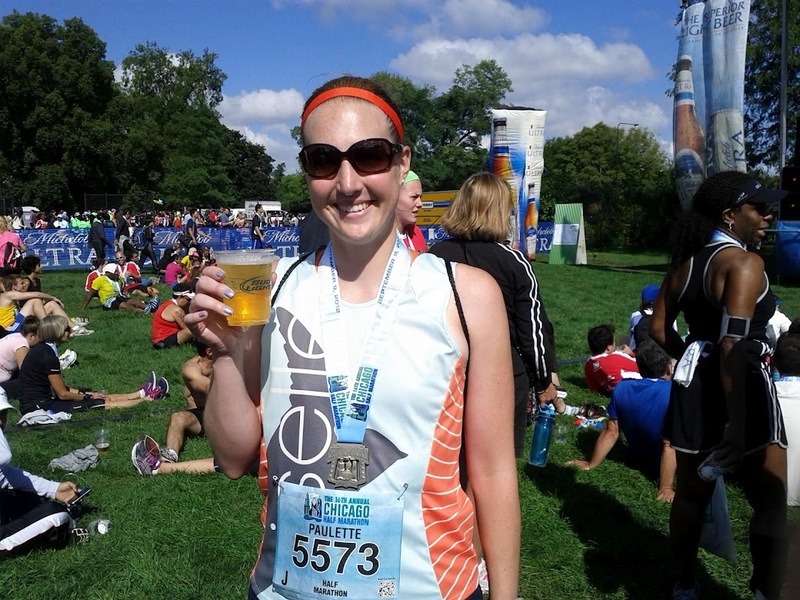 The Chicago Half worked conveniently into my visit and my training schedule, so of course I signed up. 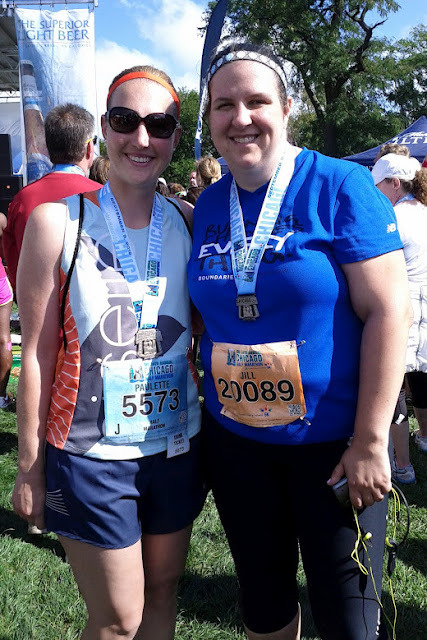 The friend I visited, Jill, started running recently and ran an awesome 5K PR at this race too. A good time was had by all. 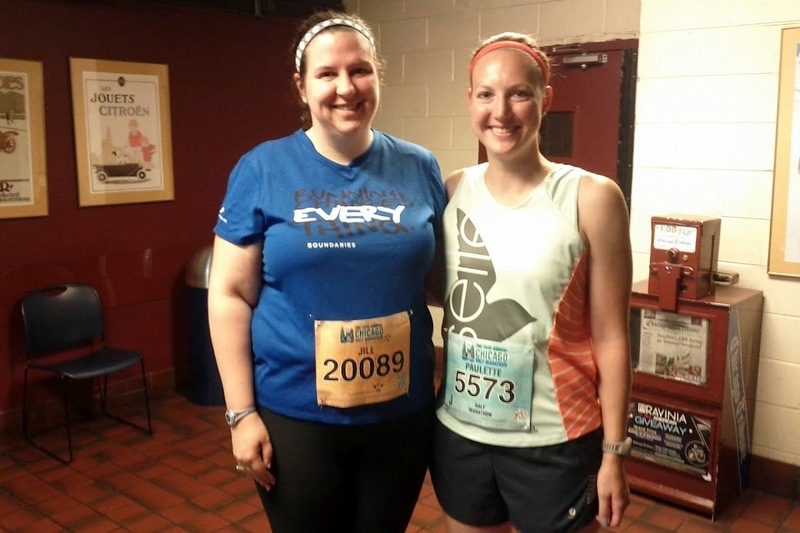 In the days before the race, I was super concerned about temperatures and especially humidity. My now California-trained body isn't used to humidity, and I'm always surprised at how much it affects my pace. To my surprise, race morning dawned cool and I found myself needing my hoodie on the way to the race. Yes! Before photo in Jill's condo building lobby. Other than the usual calf tightness I felt good at the start. I began noticing the humidity quickly even though it was cool, but it didn't seem to bother me much for a while. This was not a planned goal race and I took the beginning at easy pace to warm up. I was feeling really comfortable and naturally started to speed up just a little. By the time we hit the straight part of the course on Lakeshore Drive, I was holding just a bit below a 10 minute pace. I truly didn't have a 'goal' pace for this race, but around this time I decided I could stick close to my PR without a problem. There wasn't anything too eventful happening during this race. We ran along Lakeshore Drive which I quite enjoyed. I stayed focused and ran along, enjoying the lake views and the sunshine. I was still holding close to my PR pace and feeling good. Around mile 9 I started to feel really hot and stuffy, likely because it heated up just slightly. Lakeshore Drive was also very exposed, so that made it even more noticeable. During mile 10 I made the mistake of trying to eat Clif Shot Blocks AND water at the same time, I decided too late when I saw the aid station, ending up with a mouthful of mush and strange breathing. Note to self, time that better next time. That really didn't work out. I noticed I was a little too close to 2:10 for comfort, so I picked up the last mile to make sure I came in under 2:10. I hit mile 13 with what I thought was plenty of time, especially because my watch matched up very close to the mile marker. However, as I was doing the last 0.1 it seemed to take longer than expected for the pace I was running at that point. I never expect my watch to match, but I did think I was a little safer based on when I hit the mile marker. I took the sprint to the finish and came in just under my old PR as well as under 2:10. I've been trying to break that goal for a while, so I'm incredibly happy! I wandered through the finish chute, was awarded the awesome medal, and grabbed a few food items. A highlight? Wet towels to cool down/wipe sweat at the finish. PRs all around. Go us! Now for a few thoughts on race logistics and organization. The Expo. I enjoyed the expo, and I wrote a more detailed post on it and the race shirts here. The Course. This course is very, very flat and fast. We started and finished in Jackson Park on the Southside, where there was plenty of space for race festivities. We arrived on Lakeshore Drive after about 3.5 miles, and from there it was an easy straight for quite some time. We ran over an overpass a little after mile 8 to make the turnaround, then headed the other direction on Lakeshore Drive back to Jackson Park. I found the lake and city scenery on this course to be lovely; there were also lots of people cheering in the park and along Lakeshore to keep you going. The Support. The volunteers along the race course were on target! I was able to get water while running each time thanks to many volunteers and good spacing. They had water and gatorade, although no gels along the course. I only wanted water so I was good to go. There seemed to be sufficient porta potties, although I can't say I paid a ton of attention to them. Overall, A+ course volunteers, thanks for rocking! The Finish Line. The Chicago Half had a fun finish area. My only complaint is that I wished they had letters for meeting friends, but they didn't. There was massage, a stage with live music, deep dish pizza, and a beer tent (drink ticket on the bib.) The finish chute itself had many options: little cookie packs, pretzels, fruit, water, gatorade, and perhaps more that I didn't see. I especially loved the individually packed wet towels for cleaning up sweat. I loved the half medals, and they gave awesome medals to the 5K participants as well. Free finish line pseudo-beer. Michelob Ultra in case you are curious. That ends this race report. Have a good one and just keep running! Great job staying consistent with your splits! Eh. Pseudo beer is way better than zero beer. Congrats on the PR! way to have a great race, Paulette.....and those consistent splits.......great pacing! Great job on the PR! I ran the Soldier Field 10 miler 2 years ago and thought it felt too crowded, but a lot of that race is on the lake trail, rather than roads. I'm glad you had such a great experience. They need to do better with the beer though - Michelob Ultra is just sad in a town with so many great craft beers. Yes - great beer in Chicago. Where is the Goose Island?! YAY PR! I'm glad it turned out to be a nice day for you!!! I love Chicago races for the flatness!! congrats!! 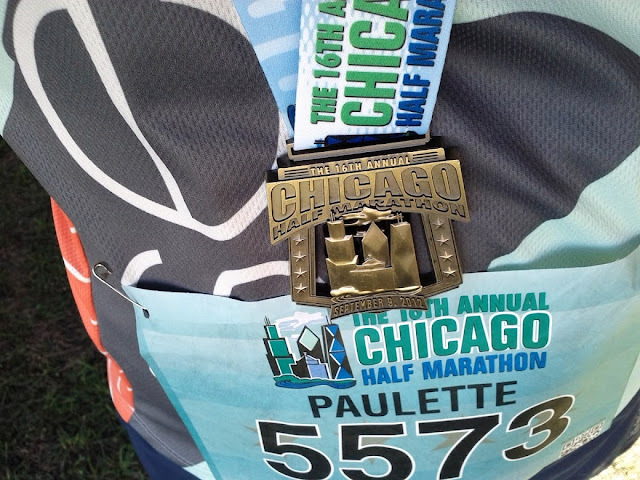 what a fun race, i love chicago! Yes I love when things go well like this, I had such a good race! Really excited you are on Oiselle Team too.